We have a problem with race. We do. It's a thing. Here in the United States of America, race has been problematic for...well...since there's been a United States of America, and from earlier still. It's the primal demon and failing of what could otherwise have been a perfectly delightful constitutional republic. Efforts have been made to exorcise this demon, but they've only gone so far. Its manifestation in the form of race based chattel slavery was washed away in blood at Gettysburg and Antietam, and in William Tecumseh Sherman's terrible-swift-sword campaign of fire and destruction. But it did not die, taking on the form of Jim Crow and segregation, which required the application of soul force, the blood and discipline of Freedom Riders and marchers and martyrs. That changed the laws, but changing laws only goes so deep. Now it's gone in deeper still, not legal and systemic but cultural and spiritual, gibbering in the deep shadows of our collective subconscious, from where it warps our application of law and poisons our views of other human beings. What was once maintained by overtly oppressive legal structures is now maintained by something subtler and more pernicious. And we don't know what to do about it. Some "conservatives" would ignore the problem. "It doesn't exist," they say. "It's not real. Stop whining, you special snowflakes. And even if it is real, it's your fault, because black people are scary and criminal. But we're not racist. We have a black friend!" Then they watch Fox News, which every day features Scary Dark People. Every step forward, every possible moment of healing? It's ignored or suppressed or mocked, because nothing is wrong. You can gun down a black boy on the street for the crime of defending himself from a strange man, or strangle a black man to death while he politely asks you to stop, and they'll find a reason to justify it. "Progressives" don't ignore the problem. They imagine themselves to be helping. There are consciousness raisings, and activities to surface privilege, and much moaning and lamenting and #shametweeting. But there is no "fixing" of the heart of the problem, because "fixing" is an oppressive construct of the patriarchy. Best to just heighten anxiety, division and resentment, and then live into that tension. Own your racism. Just sit with that reality. This is as helpful as the oncologist who wants you to "own," "sit with," and "live into the tension of" your cancer. Racism must be destroyed. You do not sit in conversation with it. You do not ignore it. It must be nuked, poisoned, cut out, and burned away with focused light. I do not presume to speak to how do do that for those whose identity is shaped by race in other ways than mine, but as a pastor who falls under the cursed category of "whiteness," I'm inspired by the peculiar Christian soul whose image...painted in fierce mural on the Kansas City statehouse...has graced my blog for more than a decade. 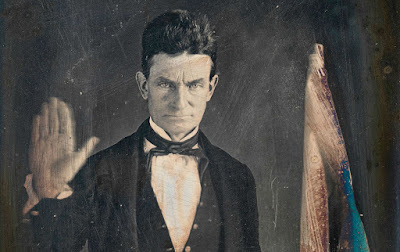 For his time, John Brown had a bizarre sense of race, so far from the cultural norm that to many it seemed insane. It has been said that he did not see race, but that isn't right. It went deeper, into his sense of self. "Whiteness" did not define his personhood, nor did the truth claims of "whiteness" guide his actions. Fredrick Douglass, who was a friend and visitor in the Brown household, marveled that the Browns just treated him like another soul, without condescension or wariness. When John Brown, visiting the house of a friend, saw that friend beat a young slave into unconsciousness? He didn't see a "white" man beating a "black" man. He saw one person violating another person, and it was a mortal horror to him. It left him traumatized and in shock. And in his peculiar witness, there's a truth. Racism dies when it is dead in our souls. When race has no claim over your identity, and no longer shapes how you relate to others, racism dies in you. The war against racism will be won by changing culture, and you change culture one soul at a time. To that end, and from my own self understanding, the idea of "whiteness" must die. I will not speak to or make claims about other "races," or other identities. But in this war, whitey must die. Again, not literally. Sweet Jesus, people. It's just a transparently provocative way to frame it. What I am saying is this: that sense that "white" makes any meaningful claim over a person must be rooted out and decoupled from identity. It must become Other. If you see yourself as defined by whiteness, then attacks on whiteness can feel like attacks on your person. It can feel like a threat, to be fled from or fought. If white is not "you," not a meaningful part of your integrated soul? If you have named it for the demon it is? Then challenges to cultural assumptions of place, privilege and power have more purchase. To that end, I offer up five ways of tearing apart a person's sense of "whiteness," a clenched fistful of ways to heighten the necessary trembling dissonance that can shatter the hold of "white" identity. The first way to kill whitey: White is BS. It's just not a real thing.